Rogue River Valley Irrigation District © 2019 All Rights Reserved. navigation to different sources of information. the end of April/Beginning of May. and a more definite date!! We want to thank all of our Water Patrons for your support as we struggle through these drought years. Please continue to review the TeaCup Diagram for the most up to date reservoir levels. Update on 2019 water season: 2018 was a rough year for everyone. We were able to get through the season, making complete and full deliveries for as long as we had the water to do so. 2019 water season will still be considered a drought season. By reviewing the TeaCup, you will see that the reservoirs are well below average and without more snow in the mountains; they are likely to stay this way. In a season of normal operation, RRVID relies on stream flow for the first 1 1/2 to 2 months of the water season. In drought years, we pull from the reservoir storage from day one. This puts a strain on the system. 2019 is looking like we will probably be pulling on the reservoir supply from day one. If that is the case, we may have another short season. 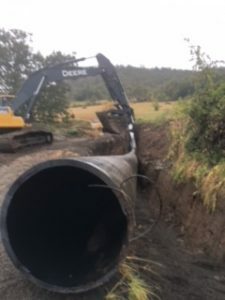 Update on the piping project: RRVID has been working on installing 3.2 miles of 48″ HDPE fusion welded pipe on part of our system between HWY 140 and Antelope Creek. This will put approximately 40 to 42 pounds of pressure to the farm with hopes of eliminating pumping cost. This is the first of what we hope to be, the beginning of modernizing RRVID. So far RRVID has been able to do all of this work through Grant dollars and State funds that we acquired before starting the project. In closing, let’s continue to hope that we start seeing more snow in our mountains so that our reservoirs continue to fill before Spring and the beginning of water season. Please continue to check back on our website to see the date that water season will begin for 2019 and other important information. Reminder: When water season begins, please call our office at 541-773-6127 to order your water or to find out your rotation schedule. Because this is a drought year, please remember to call and tell us if you do not plan to use your water so that we can conserve as much water as possible. 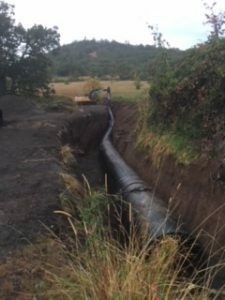 The Rogue River Valley Irrigation District is pleased to report that we have received the needed additional funding from the Oregon Legislature to install the Bradshaw Drop Piping Project. We plan on starting to lay pipe later this year and should be finished in 2019. We want to especially recognize Rep. Pam Marsh for all the assistance she provided in getting the funding restored after our project’s funding was initially approved but then canceled last year. Rep. Marsh worked tirelessly to help communicate the benefits of the project to the leadership of the Legislature as well as the governor’s office in addition to working across the aisle to reach broad bipartisan support for our project. 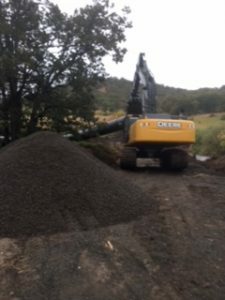 We also want to thank the environmental groups, local municipalities and agricultural producer organizations among other various local entities whose support was integral to showing that this project had wide-ranging benefits for Southern Oregon. RRVID has started the process of installing the 48" fusion weld pipe. The first step is to install the two siphons. 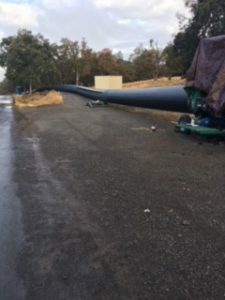 These photos show the welding of the pipe and the installation of one of two siphons. 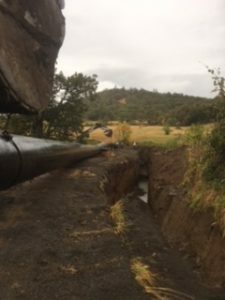 RRVID was successful in obtaining $1,895,000.00 from the Oregon General Fund to put toward the Bradshaw Drop Piping Project. We now believe we have all of the funding in place to put 3.3 miles of open canal into pressure rated pipe. RRVID will be making two stream crossings within the in-stream work period between June 15th and September 15th of 2018. 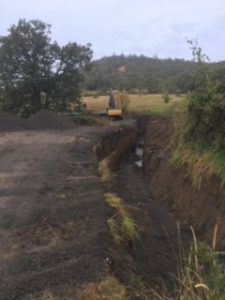 We will then start putting the rest of the canal in pipe after the 2018 irrigation season has ended which will be around the 1st of October. Click here for information regarding the Bradshaw Drop Project. 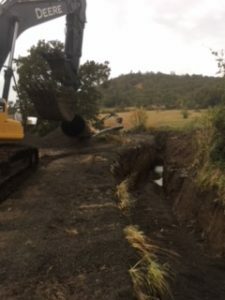 The Board of Directors and Management of the Rogue River Irrigation District are pleased to announce that we have entered into a grant agreement with the Bureau of Reclamation to pipe an approximately 1.2 mile section of the Hopkins Canal from Spring Creek to Antelope Creek. RRVID is also looking to obtain additional grant funding for a connected canal piping project that would allow us to provide pressurized water to our patrons along piped sections of the current Hopkins Canal to Bradshaw Drop. We are also partnering with the Jackson Soil and Water Conservation District (JSWD) to look at opportunities for our patrons to receive assistance in converting from flood to sprinkle irrigation systems. We are excited about the benefits this project will have for our District and its patrons. 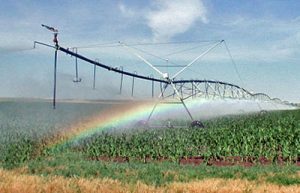 Any water user who owns and/or leases irrigated land totaling 40.1 or more acres west of the Mississippi River must annually (or more often) file RRA forms with the District office prior to receiving irrigation water. If your landholdings change in any way during the irrigation season, which includes, but not limited to: moving your property into a trust or the passing of one or more of the property owners, then it is imperative that you contact the District office to update your RRA forms. The April 2019 Board Meeting will be held at the District office at 1:30 p.m. on Wednesday April 17, 2019. Rogue River Valley Irrigation District © 2018 All Rights Reserved.